Dallas Buckhorn refuses to believe it. His angelic girls wreaking havoc? Never! But their teacher, Josie Griffin, insists on making him feel like the worst father on the planet. He only wants his daughters to be happy. How can that be wrong? 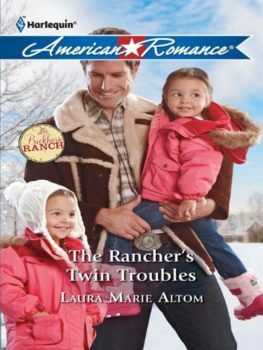 Josie knows the Buckhorn twins aren’t bad—they’re just spoiled by their overindulgent, and ruggedly handsome, cowboy daddy. But she also has a job to do, and she can’t do it when the twins are out of control in her classroom. Josie might be hard on Dallas…because he seems oblivious to how lucky he is to have his girls. Her own tragedy haunts her, but the more she spends time with the Buckhorns the more she imagines herself in their family picture. But that means saying goodbye to her past, and she’s not sure she can do that….